Creamy and delicious cheesecake bars made with a rich caramel sauce and glaze that are out of this world! Sure to be a hit with your family! Geez why am I so obsessed with cheesecake? I love it so much! It really is my favorite dessert and no secret if you have been following along. But first. 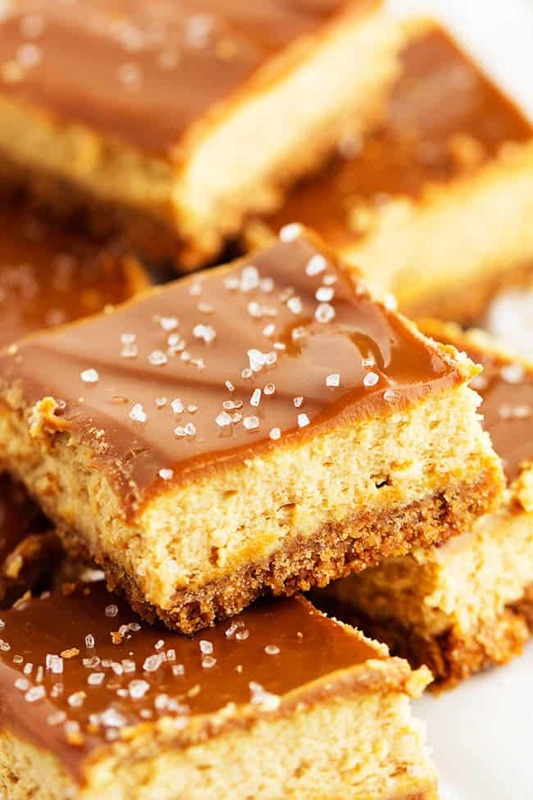 Lets talk about dulce de leche. Heaven. That’s what it is. I just discovered that you can buy it next to the sweetened condensed milk. 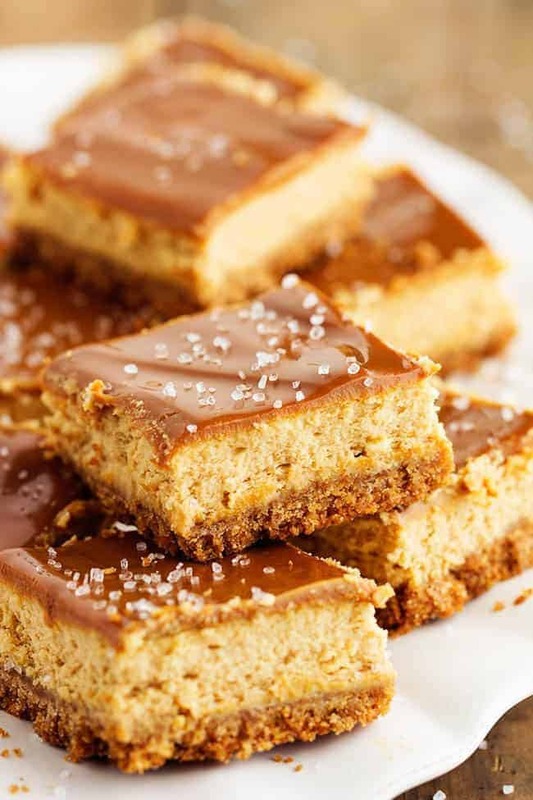 It is a rich and creamy caramel sauce that is perfect for baking and using as a delicious caramel glaze. It starts with a buttery graham cracker base. That is one of my favorite parts of cheesecake. 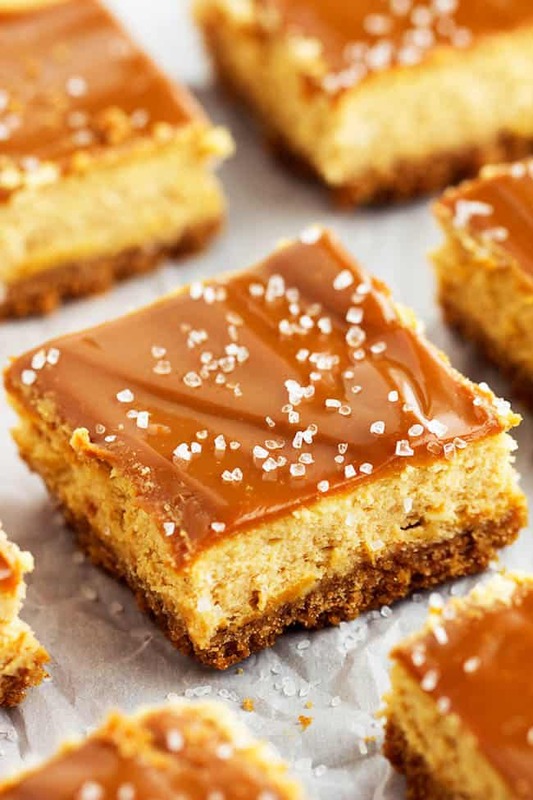 But the cheesecake layer gets mixed with this dulce de leche adding a rich and caramel flavor. Then they get glazed with the dulce de leche. These are an amazing dessert. And I decided to sprinkle them with a little sea salt because I love the sweet and salty combination. But it is totally optional. 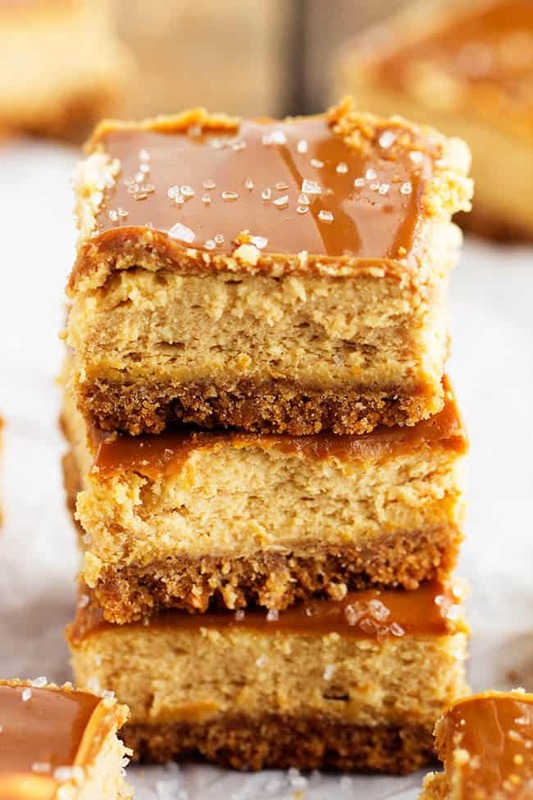 If you love cheesecake and caramel you are going to love these bars just as much as our family did! To make the crust: Preheat oven to 350 degrees. Line a 9x13 inch pan with aluminum foil or parchment paper for easy removal. Mix graham cracker crumbs, sugar, and cinnamon in a medium bowl. Add the melted butter and stir until coated. Press evenly in the bottom of your pan and bake about 10 minutes or until golden brown. Cool completely. To make the filling: Beat cream cheese and sugar together until creamy and smooth. Add eggs one at a time and scrape bowl as needed. Add dulce de leche and vanilla and continue to beat until smooth. Spread batter over cooled crust. Bake until center is just set and edges are lightly golden brown and starting to crack about 35-38 minutes. Cool completely. For glaze: In a microwave safe bowl heat dulce de leche and 3 tablespoons cream in the microwave stirring after 10 seconds at a time. Stir to blend and add more cream if needed and too thick. Pour glaze over cooled cheesecake and refrigerate about 1 hour until chilled. Sprinkle with sea salt if desired. I definitely don’t think there is a problem with being obsessed with cheesecake. And topping it with a dulce de leche glaze and sea salt. Mmm! Was very delicious !!!!! Have you ever heard of this process? I have had this scrumptious recipe bookmarked forever, and I finally made them. They are so good and easy. We loved them!